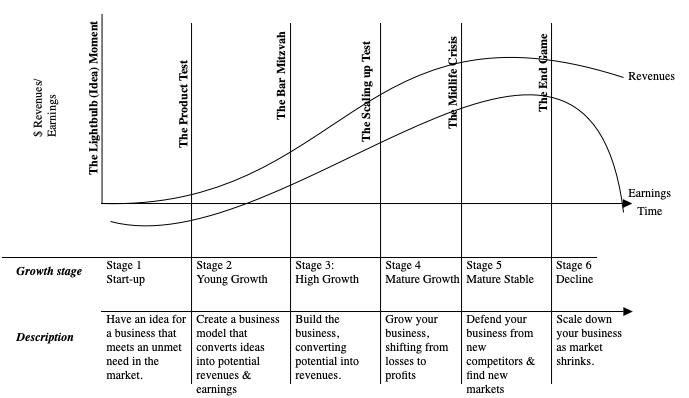 I came across this interesting post by Barry Ritholtz which talks about portfolio construction and how it has evolved in the US markets over the years. To paraphrase; earlier portfolios were built based on narratives. Fund managers regularly used stories to identify good companies. For example: “The firm is gaining market share at the expense of the competition” or “The quality of the company’s management is top notch”. These story-driven portfolios were then marketed via data: rankings of fund performance, ratings from companies like Morningstar and net return data. I found this to be very amusing because it is how the Indian fund management operates TODAY. We also have funds that are constructed based on stories of quality of management or longevity of the business or based on themes such as infrastructure or consumption. It is very common for fund managers, in private, to talk up narratives of the companies they invest in. We also have numerous publications from ValueResearch and others that rank mutual funds and tell you, based on past performance, what you should buy this year. Barry mentions how this style of investing would appear “quaint” to his younger readers. In the US today, portfolios are cheaply constructed using computer driven mathematics and are marketed with narratives such as indexing, factor based investing, ESG, smart beta etc. For me the question isn’t about “if” this story will play out in the Indian financial markets, but more about “when”. There are a number of misaligned incentives the perpetuate the current system, but we are already seeing the start of change driven both the competition and by regulation. Today active fund managers in the large cap space already find it difficult to beat the index and we have already started seeing a number of fund houses launch smart beta ETFs. This story took about two or three decades to play out in the US. I would bet that things would change much faster here in India. We take a look at equity valuations and find that they have moved into even more expensive territory. We use data from the NSE website starting from when it is available in January 1999 to look at the P/E Ratio, P/B ratio and the dividend yield of the index and compare it to past history. In the chart above, the red areas highlight when the PE ratio is significantly higher than normal implying that markets are expensive and future returns are likely to be lower than in the past. On the other hand, green areas show when the PE ratio is significantly lower than normal implying that markets are cheap and returns from equities should be higher than average. 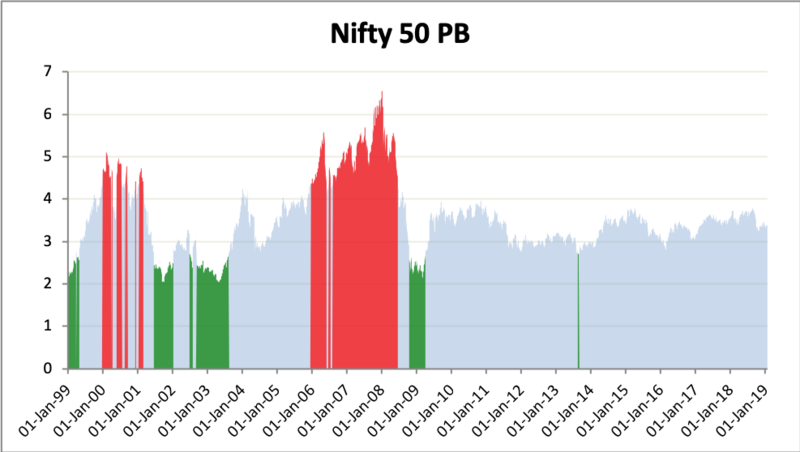 On 25th January 2019, the Nifty PE Ratio was at 26.1 which is more than one standard deviation from the historical average of approximately 19. Market valuations have corrected from the value of 28.1 seen in August, but continue to remain expensive territory from an earnings point of view. 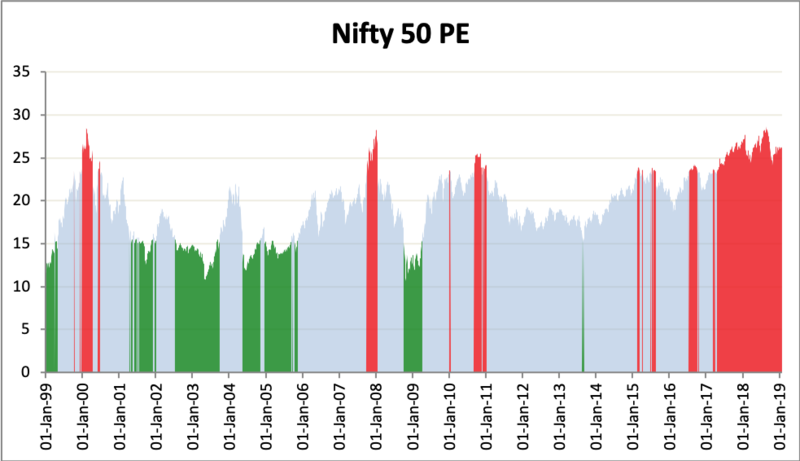 Similar to the PE chart above, red areas in the PB chart denote times when markets are expensive whereas green areas show when markets are cheap relative to history. The price to book ratio of the Nifty has stayed 3.3 and is just below the long term average of 3.5. On the basis of book value, markets are trading in the normal range. The difference between valuation indicators in the PE and PB could be due to cyclically suppressed earnings. Part of this could be due to low capacity utilisation and part of this could be attributed to structural NPA issues with public sector banks that are depressing earnings. Therefore, even though the price is expensive on the basis of current earnings, it could be that an increase in utilisation levels or a normalisation of the NPA situation could give a bump to earnings in the future and normalise the PE. 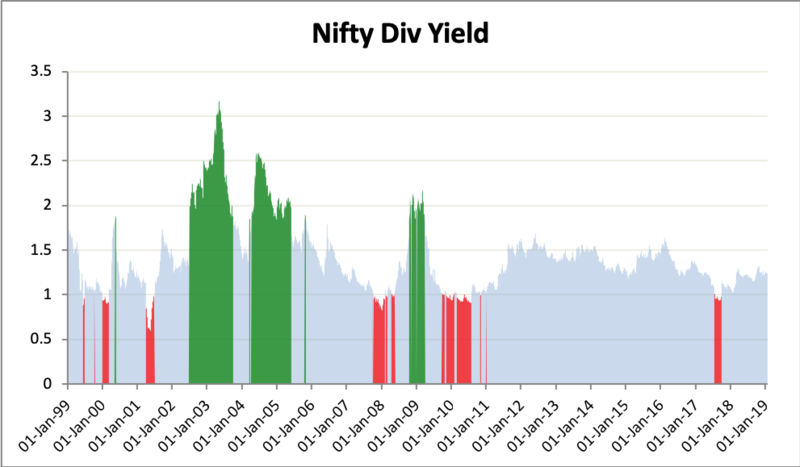 The dividend yield chart denotes value in a manner that is opposite to the PE and PB charts above. When the dividend yield is higher than normal, it means that markets are cheap. Similarly when the dividend yield is lower than normal, it is a sign that markets are expensive. The dividend yield is around the same levels in the last quarter, at 1.3 per cent. This is still close to the long term average of 1.5 per cent. On Amazon as a disruption platform: it is unclear if Amazon will ever make money on any new business it enters but it is guaranteed that the existing players will lose money. The Sensex was flat for the month and has outperformed its peers in both emerging and developed markets. Broader markets fell sharply led by the fall in the S&P500 of around nine per cent. Barring the Sensex, most equity markets have given negative returns in the last year. 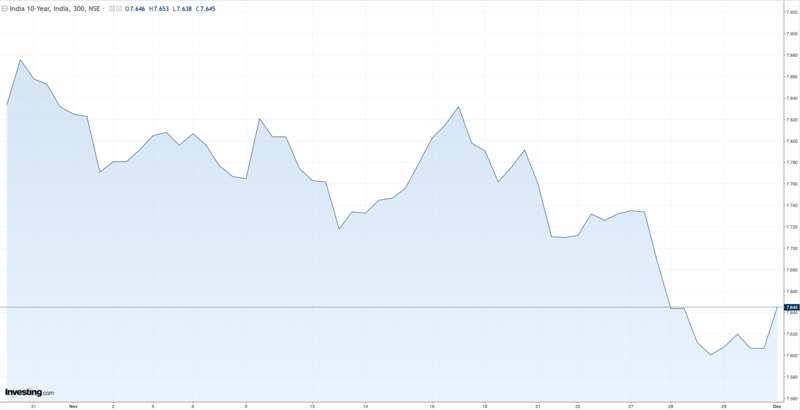 Indian bond yields continued to correct in December, falling from 7.65 to 7.43. The collapse in crude oil prices and an easing of the liquidity situation has led to some relief in the bond markets. 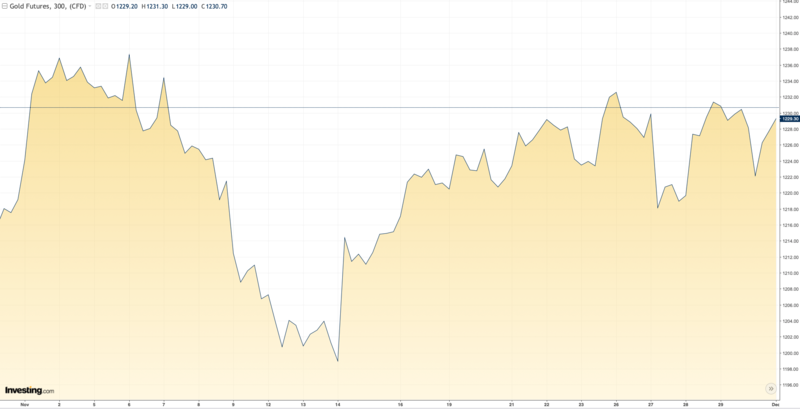 Gold moved higher, but still was within range during the month. If the commodity moves strongly away from 1200-1400 dollars per barrel, it would give a better indication of the long term trend. Oil continued to fall in December. From a value of 86 in early October, it closed at just above 54 dollars per barrel at the end of last month. This is a very sharp correction and is a positive development for the Indian economy because of our large dependance on oil imports. It is important to keep an eye on this figure as it can have a destabilising effect on our macros. The Rupee was range bound in December, reflecting global currency movements. The Sensex and the S&P500 both outperformed their broader emerging and developed market peers respectively. The Indian market in particular bounced back strongly after a few months of correction. 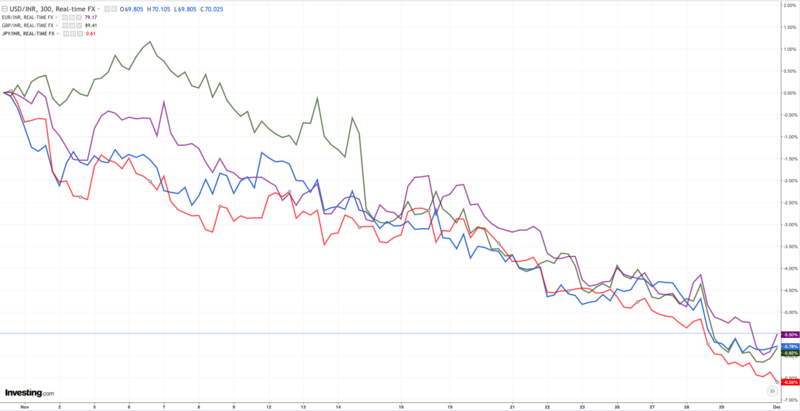 Meanwhile the broader emerging markets and developed markets have fallen sharply in the last year. Indian bond yields corrected in November from 7.88 to 7.65. 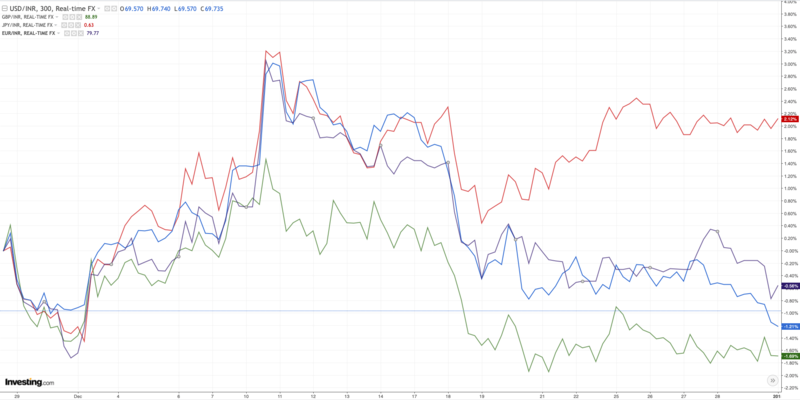 The collapse in crude oil prices and an easing of the liquidity situation has led to some relief in the bond markets. 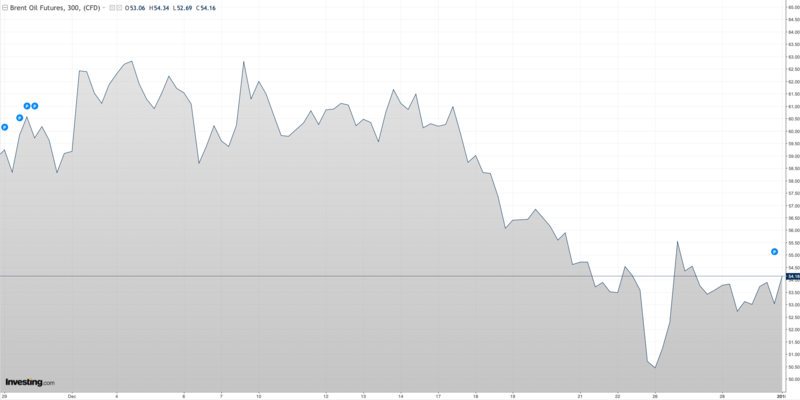 Gold stayed in range during the month. If the commodity moves strongly away from 1200-1400 dollars per barrel, it would give a better indication of the long term trend. Oil continued to fall in November. 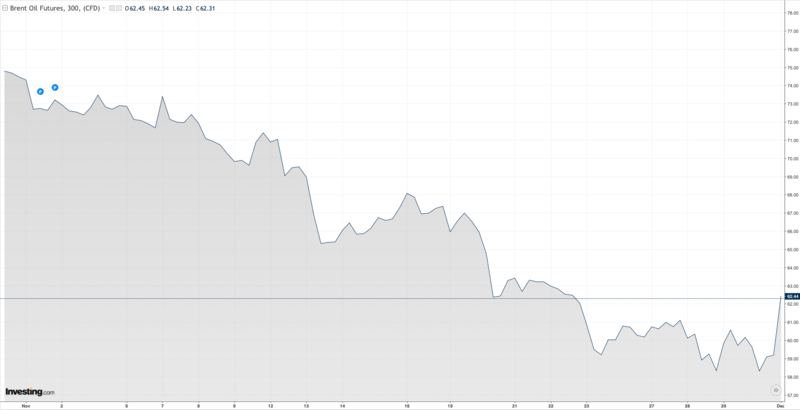 From a value of 86 in early October, it fell to to just under 62 dollars per barrel at the end of last month. This is a positive development because of our large dependance on oil imports. It is important to keep an eye on this figure as it can have a destabilising effect on our macros. The Rupee appreciated sharply against all major currencies in the last month, to the tune of roughly 5 per cent. This is probably linked to falling oil prices and a return to normalcy in the market from the earlier panic situation.